A crown is often a great method of preserving a tooth, protecting it from further damage and preventing future problems. If you need a crown, Dr. Chang will fit it over your existing tooth. The crown can then act as reinforcement and guard against further cracking and breaking. 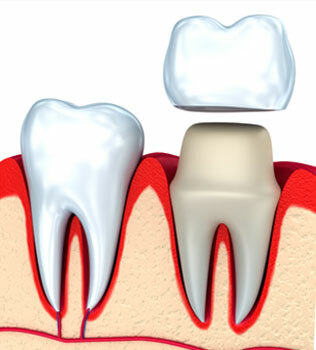 Many times, a crown even prevents the need for a root canal or extraction in the future. However, metal crowns can be unattractive – even on back teeth. For this reason, we have porcelain crowns available at Bloomvale Dental. Porcelain is tooth-colored and almost completely indistinguishable from natural teeth. It is also a resilient material and can easily withstand wear and tear, lasting for years. You don’t have to sacrifice appearance for durability. Schedule a consultation at Bloomvale Dental by calling (951) 325-4600 and receive a porcelain crown quickly and professionally.